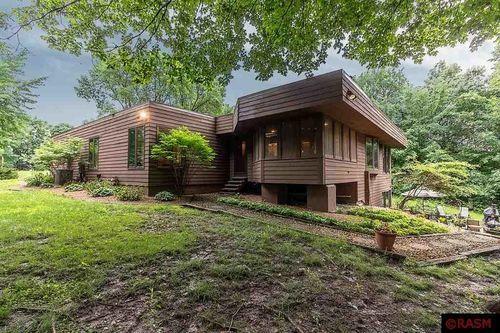 Tucked away on a serene, nature-filled 3.29 acre lot, this 3,800+ square foot, mid-century modern oasis is awaiting new owners! Thoughtfully renovated to maintain the original character while updating with modern amenities, this is the definition of move-in ready. As you enter the home, you are greeted by Kasota stone accented walls, and stunning new maple hardwood flooring that flows throughout the home. The open-concept kitchen, casual dining area, formal dining, and sunken living room are perfect for entertaining. The flawless kitchen has been completely updated with all new appliances, custom cabinetry, quartz countertops - including a dramatic waterfall kitchen center island with breakfast bar seating. The sunken living room is complete with enormous windows, soaring tongue and groove vaulted ceiling, and elaborate floor-to-ceiling limestone fireplace. Enjoy your morning coffee and nature at the same time in the enclosed 3-season porch adjacent to the casual dining area. Off of the kitchen is a large laundry room with incredible storage. All four bedrooms are located on the main floor including the master suite, as well as a full guest bathroom. The lower level is complete with a large family room with corner fireplace, wet bar, 3/4 bathroom, storage room, and walk-out access to the backyard and patio. There is fresh paint and new flooring throughout the home, and all of the lighting has been updated to LED lighting. Outside you will find an oversized 2 stall garage, mature landscaping and an incredible ravine that leads down to a waterfall and creek! Don't miss out on this one-of-a-kind home!